With a much milder than expected start to the day we load the boat at about half Six and get the whips out to collect some live baits. Something is not quite right as 25 minutes later, neither of us has had a single bite ! There are small fish "Topping" in the marina but for some reason, not feeding. Finally after about 40 mins Neil catches a small roach and we start to get bites. Ive switched to a worm hook bait to try for some perch. 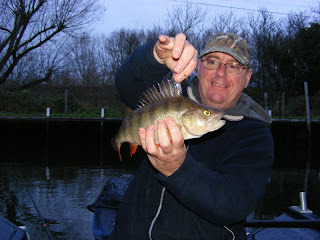 I also start to get bites but the Perch are TOO BIG for baits at up to a pound and a half, good fishing in its own right. Too Big For Bait ? Eventually we have enough baits and set off for Surlingham. Apart from Two anglers on Bramerton Common there are few people about and even less boats. We moor up close to the reeds just about 200 yards upstream from the Surlingham Ferry and both put out one dead and one live bait out. Although it looks perfect, we don't get any signs at all. We stick it out for Two hours, the only sign of any life was when an Otter swam past the boat, underwater, leaving the tell tale trail of bubbles behind. It surfaces about 50 yards to our left before climbing out and disappearing. That makes our mind up to move to our normal back up area, the outfall. Once we are settled in there at 11:30am the lunch goes on together with a fresh brew. Again we both fish one dead and another live on our rods. Neil has only just finished eating when his float slides off, The braid pulls tight and he winds down and sets the hooks. Nothing ! As is normal when this happens, he positions another bait straight back in the same spot. My live bait then goes and i wait a few seconds longer before hitting it. The fish gives two sharp kicks and it too is off. I leave the bait out where it was dropped and its taken straight away, this time its hooked and landed ok. A 4lb jack the culprit. 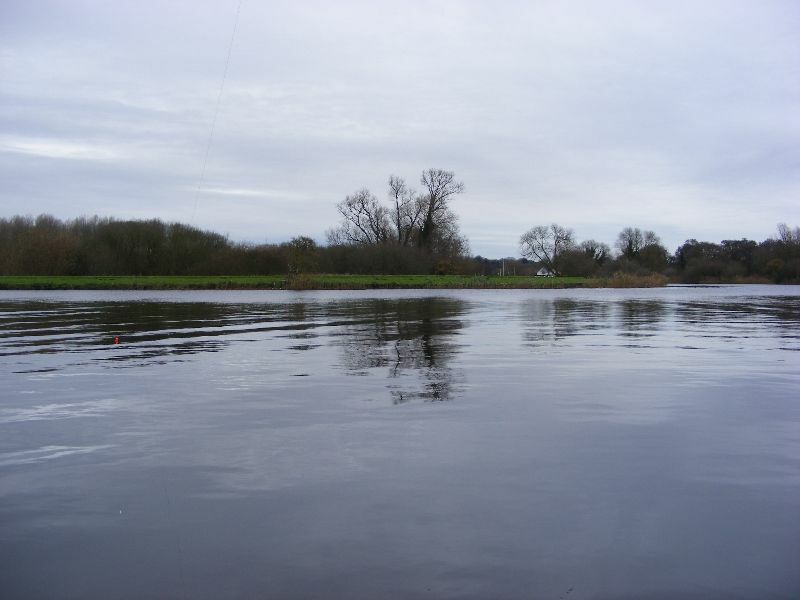 Neil changes his live bait rig to a "Roving" set up to explore more of the river. As the bait is trotted through in several different areas he gets a nice positive take and run. 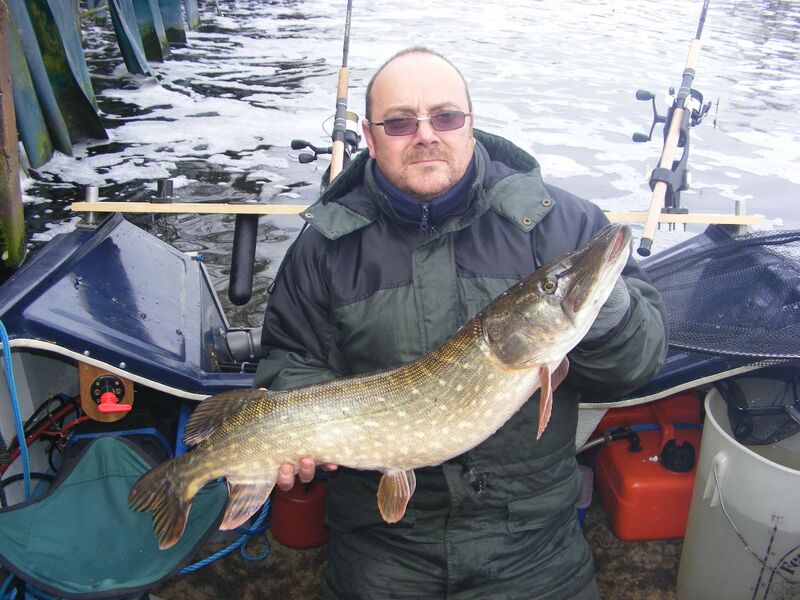 This fish gives a good account of itself and is netted first time and boated. 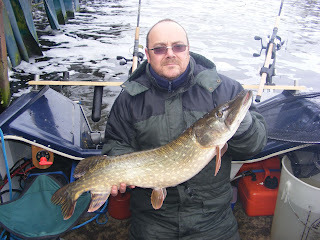 It goes 12lb 8oz on the scales and is Neils new PB. 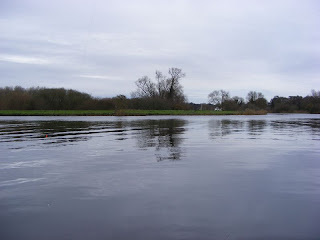 We fish on until around half One when it starts getting very "Grey" up above. The rain comes a little earlier than forecast and we decide to pack up and head back before we get a real soaking. As i reel in my live bait rod, there is a small fish already hooked. I easily bring it to the side of the boat and manage to unhook it in the water and release it straight back (about 5lbs). It was a shame Surlingham did not produce but its another area we will re visit in the future.